I am writing to you because I wanted to tell you that Angel Time is one of the best novels I have ever read. Toby O'Dare is an extraordinary character, and his spiritual journey can only leave one speechless and in amazement. What strikes you about Toby from the beginning is his clarity of mind, the painful, lucid manner in which he scrutinizes himself, and this makes him similar to Dostoyevsky's character Raskolnikov. He never tries to lie to himself about what he does, or to accept the false consolation that The Right Man gives him, when he tells him that he is working for the good guys. What I love about Toby is exactly what Malchiah sees in him: "a bright and shining goodness that nothing could completely efface, a great glowing sense of right and wrong that had never been forfeit to the lie" And of course, Malchiah's apparition is as wondrous to me as a reader, as it is to Toby himself. I for one, would have found it difficult to believe that an angel could enter one's life and offer salvation when one least expects it, and yet in reading about Malchiah a sense of the miraculous overcame me. Every word he says to Toby inspires faith and hope, and I think there has never been a more appropriate description of an angel than the one you gave Malchiah . Before ending this email I just want to thank you for writing this book that has given me hope above all, and has made me meditate on things that I often avoid thinking about. I can't wait for the second book of the series. You can publish this letter if you want. First I want to give thanks for the opportunity you have give all your�fans to give feedback about your books. Angel Time is a GREAT BOOK. I have always liked your books, and the way you present the stories.�For me your books always have a main theme and a second theme, usually�very deep.� Angel Time is one of those books with a main theme:�Redemption/Salvation. But a second theme could be found if the book is�analyzed.� For me, the second theme is God Loves You No Matter what�Religion You Believe. Other themes found could be: Justice vs. Unjustice, Faith, Beauty in�the heart, Fair. I looked on the internet information about Norwich, and I found�Brilliant your idea on how bringing justice to two people could save a�lot other. Hope to read another great story from you soon. I just wanted to take a few moments and let you know my thoughts on�Angel Time.� I finished reading the novel this morning and�fell in�love with�the story.� I thought you did a tremendous job of bringing�in the past and present to in order to change�a character's�path.�While I have been a fan of yours I was not expecting anything less�than greatness from the novel.� And you did not disappoint, you�have�such a way with�words that I only can hope to be as articulate�as you�some day.� Being a new writer�I find myself constantly struggling with�the words.��Throughout�the reading of Angel Time,�I noticed my almost�immediate compassion for Toby and what�the character had to endure.�While the�death�of�his family was very hard to read it deemednecessary to progress his character and gave validation for�what was�to come.� I especially liked your lines�about Jezebel due to the fact�while in church yesterday the Pastor specifically spoke of her and it�was fresh on my mind.��The novel made me laugh and cry and most�importantly think.� Keep�up the great work (which you don't need me to�tell you that) and I look forward to reading your next work. Dear Anne, you may not remember our past exchanges or me, surely your�fan base is large enough to render such correspondences�inconsequential, still I thank you for your past kindness. This is one�more impudent request for your indulgence of time. impetus for a higher calling then simple story telling. But then, you�never truly wrote simple stories did you? You wrote of goodness and of�a possible goodness even among the godless, a god you doubted at�certain points and, if I read this story correctly, were at odds with�on many counts. I could not help but notice the line where you mention�that the truly faithful can often be seen as simple. In a world where�logic is the knifes edge to the blade of intellect, faith cannot�compete. I am not among the faithful nor am I believer in what I perceive as�nothing more than early mythos wrapped in vary colored packaging.�Never the less, I truly understand the desire for salvation and higher�destiny then my own limited intelligence is able to supply. Perhaps it�is from my own protestant fundamentalist background, or maybe from my�journey from faith into the darkness of self-despair which engendered�a life of anger and often violence. I will admit to being drawn to�your solitary killers�who are not evil in and of themselves yet monsters they are mostassuredly. My own evils are not nearly a large when weighted against�your characters seeking to�redeem themselves, but irrevocable and�unchangeable they remain just the same. Christian. I am also sure that your earlier devotes of your Vampires�and creatures of libido and hunger find your transition less than�appealing. But you are no longer so concerned with mere human�accolades it would seem, and that gives you the power your writing has�almost always had, courage. Do you feel redeemed? That was a silly question, of course you do, you�have started a new and quieter character out who is freed from himself�and unambiguously bound himself over to the Lord. Once again perhaps I�read more into your latest work then you intended and thereby misseverything yet I feel as if that is not the case. I have enjoyed you�and your art for sometime now and I have watched you work through your�spiritual quest through specters and other ageless characters to�rotate back to the faith of your youth. Thus, I am not surprised nor�repelled at your latest turn of works as it seems you maybe happiernow then you have been in a very long time. I truly hope this is so. May peace be your reward and a quiet heart your inner Eden. I have never really thought about angels, but I am coming across the subject increasingly. I was watching Joyce Meyer, and she said that one man, who went to hear her speak, along with his wife, broke down and wept half way through. When his wife asked him why he was sobbing, he asked her, couldn't she see the tall figures in white who surrounded Joyce on the stage - at first he had thought they were the choir! I loved the story of Lea and Rosa. I didn't expect to love or care for those characters, but I did. I live near to Lincoln, and you have sparked my interest about the Jews in this area. You told me that you feel "Christ the Lord: The Road to Cana" is the�best thing you've written.� I read that, and followed it with "Angel�Time".� For me, "Angel Time" might be the best thing you've ever�written! good...who doesn't long for these things? To have captured it all in a work of fiction that leaves the reader�feeling an emotional echo of the best things that might be possible in�a well-lived life...well, I can't imagine a better book that this! I hope the affairs of angels in the world of men becomes a regular�theme of your work.� If ever the world needed to be reminded of hope�and the ability to reconcile with God, it's in our time, now. 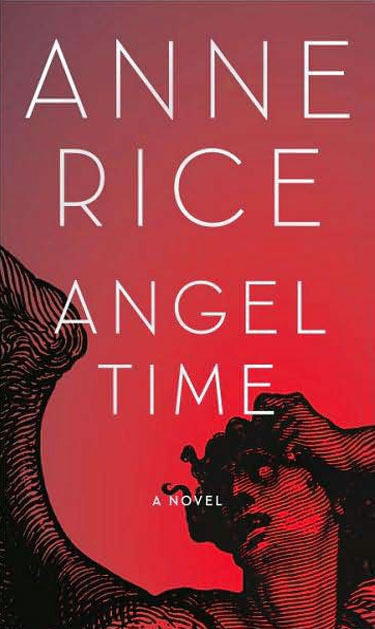 I have finished reading Angel Time and would like to mention in light of recent discussions and comments on your Facebook page, that this is a novel which can be enjoyed by any reader, whether Christian, Pagan, Jewish or Buddhist.� And especially by any Anne Rice fan. 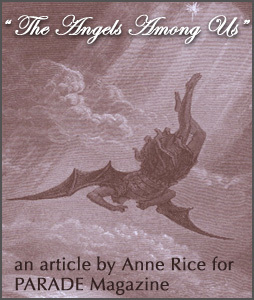 Just as I was never inclined to label your earlier work as “atheist” novels, I see no need to define Angel Time as Christian.� It’s an Anne Rice novel � no further definition is necessary. Again, you’ve created characters fully committed to their individual beliefs and choices.� I especially love Godwin and the detailed description of his Dominican life in Paris.� I shared Toby’s awe of his surroundings and noted it’s “remote yet familiar time”.� Angel Time felt more like the Vampire Chronicles for it’s sense of supernatural adventure, and has an utterly distinct tone and essence from the Christ the Lord series.� While there is a comforting familiarity that distinguishes an Anne Rice novel, each one has it’s own unique voice and defies labelling of any kind (much like your fans).� That’s why I continue to read, discuss and discover each new world you create. Thank you for your rare gifts of darkness pierced by light. I want to tell you that all of your books have entertained and�enlightened me over the years.� None have touched me as much as Angel�Time.� I grew up a child of an alcoholic mother.� Your portrayal of Toby's plight to make up forwhat his mother could not be, and mask�her ugly addiction from his brother and sister mimicked my own life in�such a way that I felt as though I was witnessing my own struggle on�the page in front of me.� You wrote this as though you experienced the�life of a child who was raised by an alcoholic parent.� If you�suffered through that life as many of us have done, I am sorry that�you too had to go through that.� If you have never actually witnessed�the life we/these children go through, you have captured it on paper�remarkably well. the sleeping demon.� Or watch as their mom falls down a flight of�stairs, breaking a leg and then having to run to a neighbors house to�ask what he/she can do for their mom because they are�too small to use�the phone.��A person who has experienced such things,�can not�understand the emptiness and despair that takes over in the soul of a�child. Thankfully, throughout the trials and tribulations of my childhood�that I lived out in secret, just like Toby,�I always knew that God was�with me.� I went to a preppy school, was head cheerleader, honor�society, etc. and no one knew the true nature of my home life except�my dad and me.� My Granny was a beautiful southern Christian woman,�who had worked hard in a factory most of her life and my mom was the�last of 5 children.� She was saddened by my mom's lifestyle and�nurtured me in place of my mother.� It was through my Granny that I�learned about Jesus, and the Bible.� She kept a little devotional�called The Daily Word in her house and I would read it cover to cover.�God sent many angels to me, and the greatest of all was myGranny,just as He did for Toby. in that I was able to witness God's strength inside of me on the�nights when I was in the deepest despair. to him for serving God�being with me on�those nights when all I could�pray for was the sun to come up.� If I listen closely, I can still�hear him whispering to�me in�my memories reminding me that "Little�ones to Him belong, they are weak but He is strong". Thank you Anne. You too, are a blessing from God to all of us who you�touch on a daily basis through your words. May God continue to Bless you and Keep you. I have just finished listening to Angel Time and the tears are still�in my eyes so moved was I by this tale. My people fled the�Inquisition in Spain in 1492 and settled in Morocco. I grew up there�myself tho I was born in Boston. My mother's people left Russia in�1916 or 17. But I have always been much more influenced by my�Sephardic heritage as that was all I knew. Because I have been steeped for so many years in medieval history,�starting with the works of Sharon Penman, Edith Pargeter, Nigel Tranter, and Philippa Gregory. Thosehistorical novels aroused such�interest that I then went on to read nonfiction books about Medieval�history, from the 10th, 11th and 12th Century on. Because of my�reading I went to Scotland, Ireland and Wales. Have you ever read The Witch of Cologne by Tobsha Learner? Anne, are you going to do a book tour for Angel Time? protection from grandparents from both sides. Lestat, to Marius, to Armand, you show to each a path to redemption�and salvation. In this way you are telling us, your readers, that�this path exists to all of us and we need only make a choice. We all�have a dark side. Whether our crimes are pecadillos or more serious,�we all carry around guilt for our dark deeds and thoughts. And you�show there is a way to redeem ourselves.�Thank you for that! and the present. We all want to serve a higher purpose, and though my�purpose might not end up being as flashy as Toby’s time traveling�adventure, Angel Time gave me hope that the things I feel burdened to�do while here on earth might have more meaning and purpose than I�realize. Angel is with me now and always has been. I can't wait to read the�next book!! Thank you so much for writing�Angel Time, it was a page turner that�was�not put down.��Long time fans will be so pleased to realize that�when you are the author, the story will be enchanting as well as a good history lesson.�I includeChrist the Lord�and�Cana�as part of�my favorites in my�book collection.�In addition, to the signed copy ofInterview�that I recieved one year as a Christmas gift from an employee, you are the only writer from whom every book must be in the library. 2. To me, the dominant theme in�Angel Time�is that the Lord God is�the forgiving God and wants us to understand and Obey his laws. He is also our Redeemer and wants His children to be Redeemed. In order to do that we must begin to have a personal, intimate relationship with God the Father, Jesus and the Holy Spirit. Only then, when we seek Him first, can we truly�know that forgiveness and peace can be ours - although we must remember that it's God's Plan not our plan.�That's the hard part............Malchiah knows this and has a new student in Toby. May God Bless You and Yours and Keep You always. I will start off by saying that I am a huge fan of your work. I was�introduced to your writings off handedly a little over 10 years ago�while rooming in a bookstore. At the time I was a beatnik college student walking the isles in a local�bookstore for more than an hour�looking for something new and exciting to read. One of the bookstore�attendants handed me Interview with a Vampire and told me I would fall�in love with the characters. After that first reading, I did indeed�fall in love with the characters and have since followed the entire�vampire series as well as the witch series. I found myself engrossed�with the storylines, the time periods which each story took place, the�histories of the characters, and the flowing ease of each tale told in�each book. called me in a fit and said she couldn’t put the book down. She was�reading the book at work, at home, while cooking dinner (burnt only�one meal�..I still ate it, made her feel better by telling her it was�Cajun, HA! ), etc. After reading the book my Aunt became a new fan of�yours. When I found out that you had written a new book, Angel Time, I ran�out and bought it (well I waited for the weekend as I am now in this�new economy a stay-at-home Mom and had to wait until all the bills�were paid). I think I read the book in 3 days. I loved it! I could�relate to Toby O’Dare on so many levels. I loved the prayers recited�and the tale of a fellow human coming to terms with�having fallen from�grace and asking the Lord for forgiveness for having separated himself�from Him. I wish you continued success with the Songs of the Seraphim. I look�forward to reading the next novel you release. I also thank you for�continually taking me to wonderful worlds of your and my imagination�with awesome abandon. On a completely different subject, it seems as though my life is in a way a shadow of yours(minus the famous author part). I too have had many battles with faith and have up until very recently walked a path of denial and disbelief. I would not so much as touch a Bible or any religious emblem for that matter because I truly believed that God had forsaken me. your Christ the Lord and Journey through Darkness books though fiction have reopened my eyes to the endless possibilities for forgiveness that not only lie within God but within myself also. I have not entirely found my faith but thanks in part to you, I have dropped my total rejection of religion. I must say Anne that I am very glad you became a writer but if you would have been a religious leader of some sort, the church(whichever one) would have been much better for it. I will eagerly be awaiting the publication of your next Songs of the Seraphim installment along with wishing you a happy life because that is what you give to people even if it is only for a few monents while reading one of your wonderful books. suspenseful moments that your readers have come to expect). Thank you�for writing this book, and may God bless you, and keep you so that you�may continue Toby's tales for a long time to come. generations are more interested in video games thanreading, writing,�or even playing outdoors!! Hmph! It's unbelievable! the Christ series and thoroughly enjoyed it, but this was just better�in that I think it would appeal to a greater mass of people because it�covers so many genres. just wondering how this fit in. I believe you are referring to his�lack of fear about what could happen to Rosa because he trusts God�will take care of it. But are you also referring to his innocence? Do�you see a simpleton as a positive or negative aspect of being so�religious? I'd like to get your take on that paragraph as it is�surprising to read that from someone who is Catholic/Christian. I was also curious if you know how I could get my hands on Interview�with the Vampire, Vampire Lestat, and Queen of the Damned hardcovers�for a fair price. I only find paperbacks and the barnes and noble�leatherbound classic book, but I never see the hardcover of these�books available.� It seems I started book shopping rather than using�the library after I finished those 3 books and don't have those�copies.� I have pretty much everything else. treasure. There is no other author I like that does this. You are one�of a kind. Many thanks for the wonderful book plates!� They were a�marvellous�surprise�at my post office box today and really made my day.� They are�beautiful.� It's really an honour to have�your autograph.� Thank-you�for thinking of your overseas readers, like myself, all the way out�here in the colonies. I've admired your writing for many years now�andhave�been a long-time�reader of your work, including�your writing under your pseudonyms.� I�must say, though, that I'm behind in my�reading and look forward to�starting your 'Christ the Lord' novels.� Actually, that applies toChristopher's�novels, too.��So little time, so many books! I read 'Angel Time' the weekend before last.� It was so engaging that�I had to take the afternoon off from my chores�to finish it!� Your�writing is always elegant and enthralling and this novel was no�different.� I hope that there will be more Toby O'Dare novels in the�future. Thank-you for giving the world so many wonderful stories, mythologies�and�characters.� I hope to be reading your novels for many years to�come. ever separated myself from you”.� It’s a beautiful story with some�wonderfully memorable lines and a great demonstration of God’s grace.�Thank you so much for the time you put into crafting this story and I�look forward to future books in the series. I loved Angel time, I couldn't put it down. I felt so sad for Tobey,�and can't wait to read more about him! I loved all of it, it's the�best book I've ever read. Only Anne Rice could have thought up and�wrote such an interesting story! There are no words to describe how�awesome this book is, I could read it a hundred times and still love�it.